The Sydney Peace Foundation has awarded its gold medal for ‘peace with justice’ to controversial WikiLeaks co-founder Julian Assange. The citation reads, ‘For exceptional courage and initiative in pursuit of human rights.’ The award is expected to be made to Assange in Sydney in mid May or at a ceremony in London later this year. This award is distinct from the annual Sydney Peace Prize. In its 14-year history the Foundation has awarded this gold medal on three previous occasions, to the Dalai Lama (1998); Nelson Mandela (2000) and Japanese lay Buddhist leader Daisaku Ikeda (2009). Foundation Director, Professor Stuart Rees says Assange was told of the Human Rights Award while the WikiLeaks founder was in jail awaiting a UK bail hearing on extradition matters. He says Assange’s moral was raised considerably on hearing the news. Prof Rees says Assange’s work is in the Tom Paine Rights of Man and Daniel Ellsberg Pentagon Papers tradition – challenging the old order of power in politics and in journalism. Prof Rees says Assange has championed people’s right to know and has challenged the centuries-old tradition that governments are entitled to keep the public in a state of ignorance. He says in the Paine, Ellsberg and Assange cases, those in power moved quickly to silence their critics even by perverting the course of justice. Assange is currently being investigated by a US grand jury. In 1792 a grand jury in the UK indicted Paine for sedition for publishing the Rights of Man. Paine’s work was regarded by politicians of the time as evidence of ‘a dangerous and treasonable conspiracy.’ This was later shown to be a fabrication by ministers who exercised an illegal influence over the grand jury. WikiLeaks’ revelations have included video of the killings from a US Apache helicopter of 17 civilians in Baghdad; corrupt practices by former Kenyan President Moi; US government plans to promote genetically modified crops and the Israeli government’s plans for war against Hamas or Hezbollah. It says Wikileaks has exposed the extent to which governments, the military and business all over the world have used “secrecy” to cloak their real intentions and activities. Julian Assange will appear at Belmarsh Magistrates Court in London on 7th February in an action titled Sweden v. Assange. Assange won bail at an earlier hearing but is wanted for questioning on sexual assault charges which his supporters say are trumped-up to divert attention from WikiLeaks’ revelations. Professor Rees says the Sydney Peace Foundation never makes awards by proxy and intends to deliver the Award to Assange in person whether it be in Australia or the UK. 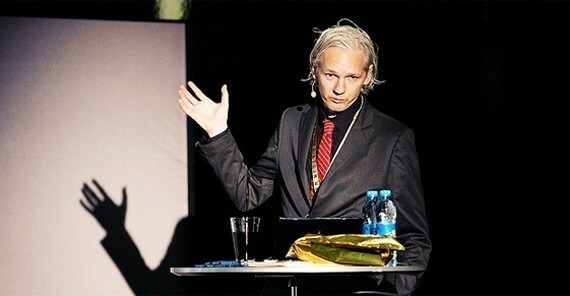 Assange is a perfect candidate to join the few courageous past recipients. As for Paine and Ellsberg, history alone will have the patience to endure and ultimately divest itself of the trumped up charges by contemporaries who intend to discredit true social reformulation. One no longer needs to hope that the world will change; now it has no choice. Nice award, but this gentleman should be getting the Peace Prize!